John Yeary was an early Republic of Texas settler who helped survey and build the Central National Road of Texas, taking land in Hunt County for his services. In 1845, he traded this land and moved a few miles west into Collin County with members of his family, establishing the small settlement of Sugar Hill. By 1854, most of the inhabitants of Sugar Hill had moved about two miles to the southwest to Whitehall, which was renamed Farmersville in recognition of the occupation of most of its citizens. Located on the main road from Jefferson to McKinney, Farmersville became a trade center for the surrounding farms and smaller communities. The juncture of two railroads established Farmersville as a shipping point for cotton, cattle, and bois d’arc posts. 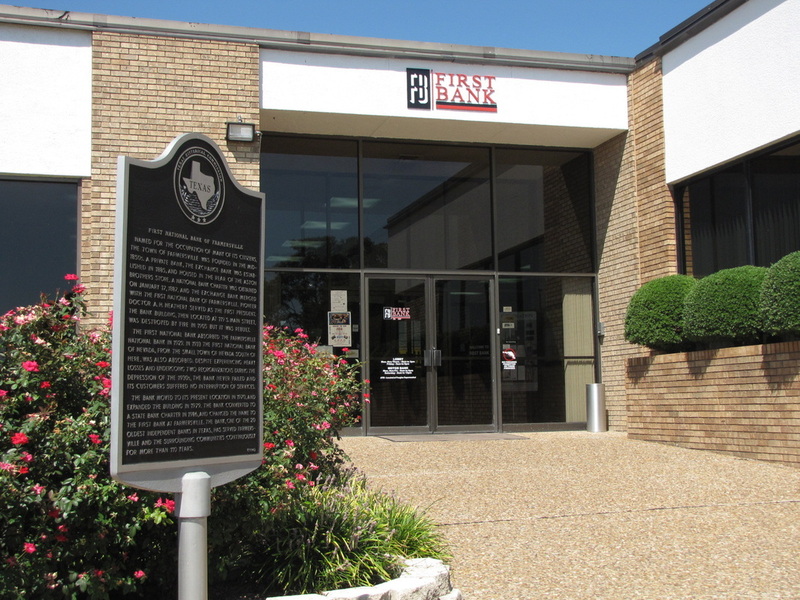 In 1885, a private bank named The Exchange Bank was established in Farmersville by W. S. Aston, Jim Aston, Sam R. Hamilton, K. M. Moore, and E. H. Pendleton, with $12,000 in capital borrowed from a McKinney bank. It was quartered in the rear of the Aston Brothers store, located on the Farmersville Square. Jim Aston served as president. DOCTOR A. H. NEATHERY SERVED AS THE FIRST PRESIDENT. WAS DESTROYED BY FIRE IN 1905 BUT IT WAS REBUILT. ITS CUSTOMERS SUFFERED NO INTERRUPTION OF SERVICES.